It’s a unique episode of the Five Point Move Podcast that offers a new voice entering the mix as a fill-in for co-host Dennis Hall, who was away coaching at the Ohio Regional Training Center. 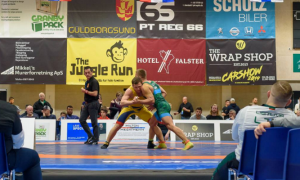 2014 University World bronze Sammy Jones (63 kg, NYAC/OTS) gets behind the mic and starts off by discussing his recent trip to Denmark that included a blitzing tech victory over Olympic/World bronze Stig-Andre Berge of Norway. The intense training camp that was attached to the tournament is also touched upon, as is Jones’ long hair (and if it gets in the way during matches), his view on preparing for big domestic events, and what prompted him to learn how to play guitar. Jones sticks around to help out with the episode’s pair of guests — National Team member Lucas Sheridan (97 kg, Army/WCAP) and last year’s World Team member at 55 kilograms — and head coach at Oklahoma City University — Sam Hazewinkel. 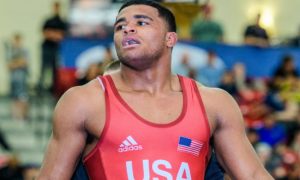 For Sheridan, who is widely regarded as a major threat coming up later this season at the World Team Trials, the subject matter mostly pertains to his competitive approach. 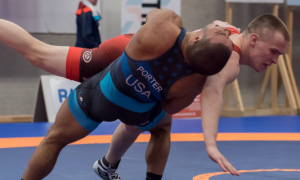 He took second at the Dave Schultz Memorial in January and followed that up with another strong performance at Armed Forces. But he has also had to watch as the two guys currently above him on the US ladder both trained extensively overseas this season, so his perspective regarding his own training and how he finds inspiration from his coaches and partners is of the utmost importance. In addition, Sheridan also speaks to some of the recent issues facing athletes, and then shares what the WCAP Forum in Colorado Springs is all about. Known as “The Legacy”, Hazewinkel just wrapped up his first season as head coach for OCU, and is on the precipice of another major inroad towards developing athletes — he just launched an RTC. 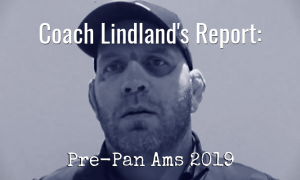 You get the full spectrum with the Hazewinkel interview: he goes in-depth about his coaching philosophy, the challenges that come with guiding young athletes, why Greco-Roman offers a big advantage for folkstyle collegians, and even tosses in a plug for 5PM’s latest entry in the Gold Medal Series featuring World Champ Mike Houck. To top it all off, Hazewinkel and Jones tell a couple of quick stories about how NMU/OTS head coach Rob Hermann influenced their respective careers.